60 Large Fuchsia Blooms Wedding Centerpieces Floral Candelabras from Shopatusm. Simply gorgeous! 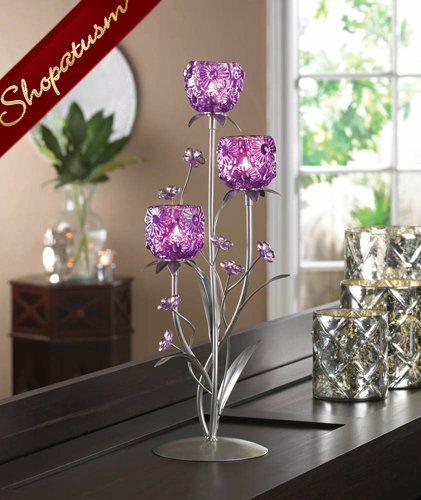 This lovely candle holder features a silvery framework of leaves and stems that burst with bright fuchsia blooms. Three flower-pattern candle cups await the candles of your choice, surrounded by precious little glass flowers. Item weight: 2.4 lbs. 6 1/2 inch x 6 inch x 17 3/4 inch high. Iron, glass and acrylic. Tealight or votive candles not included.